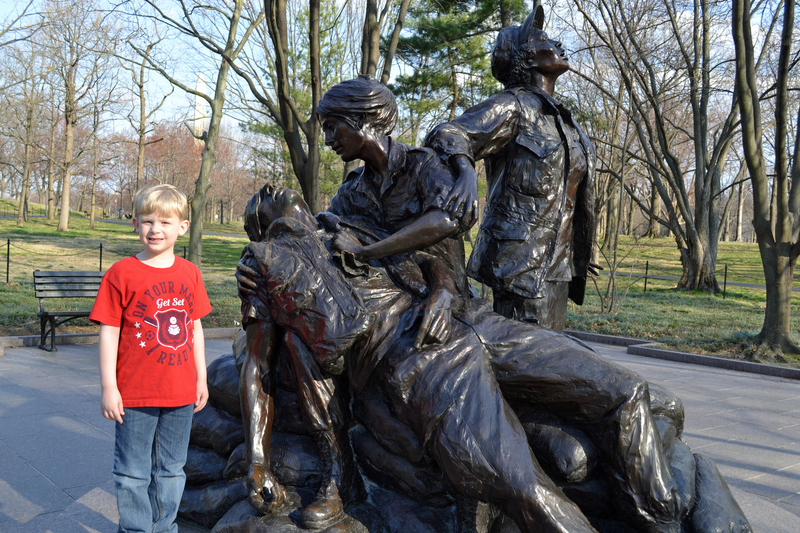 After seeing the Lincoln Memorial, we visited the nearby Vietnam Memorial before making our way back to the van. 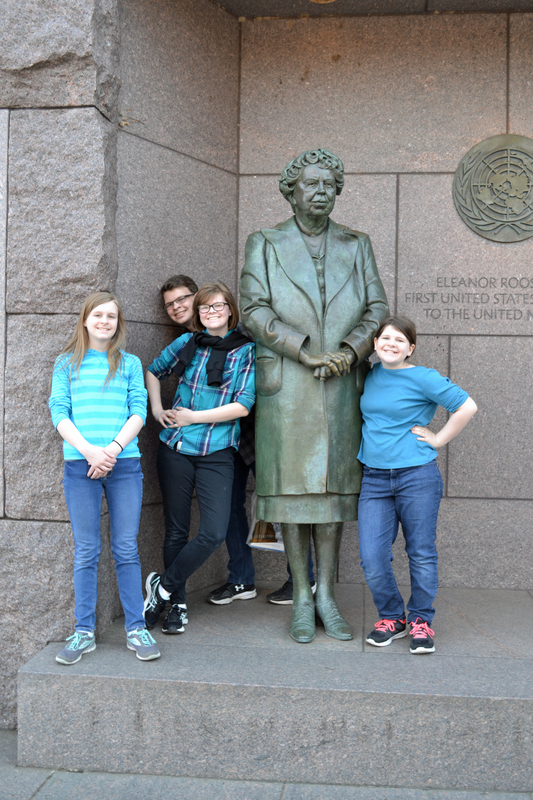 On our way, we discovered the memorial to FDR and Eleanor Roosevelt. I had never seen either of these monuments before. 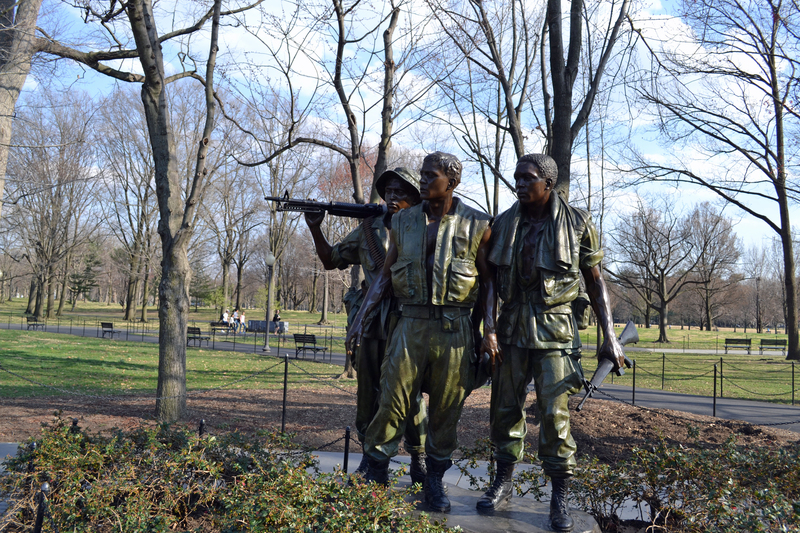 The Vietnam Memorial was a somber place. As a young girl, I saw an interview with Maya Lin, the designer of the Vietnam Memorial, on a program called Reading Rainbow. She described how she chose the material of gabbro because it is like a mirror when dry, but the reflective quality vanishes when wet. 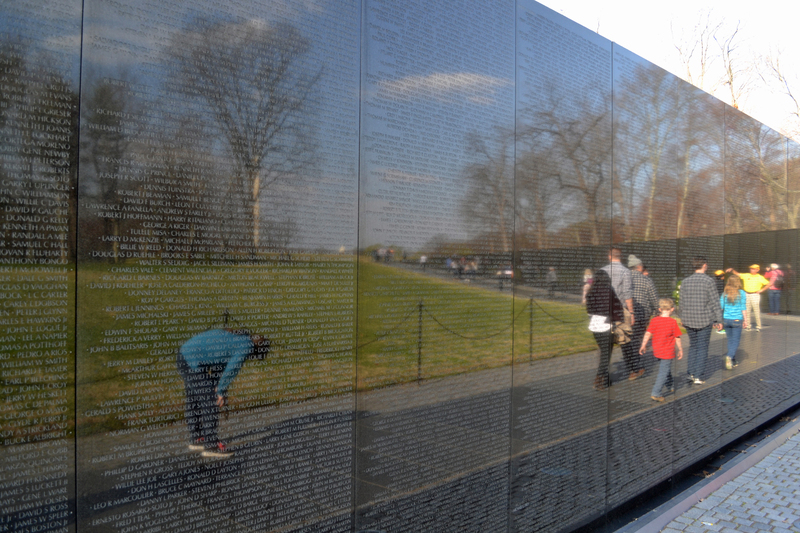 The names of the fallen are engraved on the wall and many people take a paper and pencil and make etchings of their loved one’s name. As you look at the wall, you can see a perfect reflection, which joins both past and present. 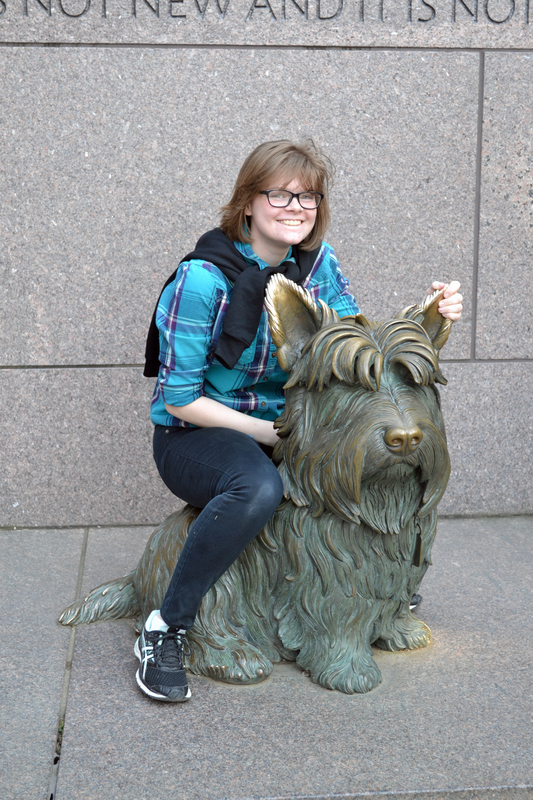 The statues in this area were very life-like. They were the type of art that made you feel as though you were back in the past, watching history happen. It was a quiet place, where you could give thanks in your heart for the sacrifices and courage of men and women you would never meet. 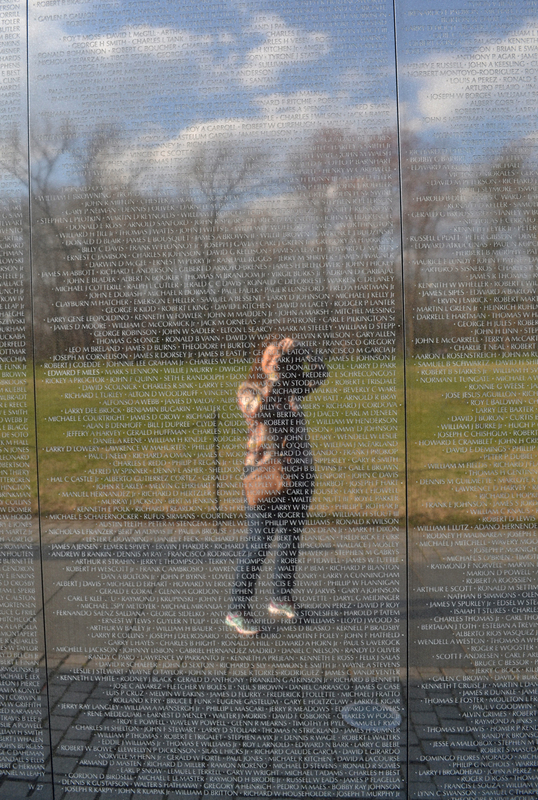 My family blending in with the brave men and woman who died serving in Vietnam. This is a monument to the nurses in Vietnam. Can’t you just see their plight? Their hardship, their distress, and then their joy at the hope of help from above? I can see spiritual analogies in this as well. It was a moving experience. 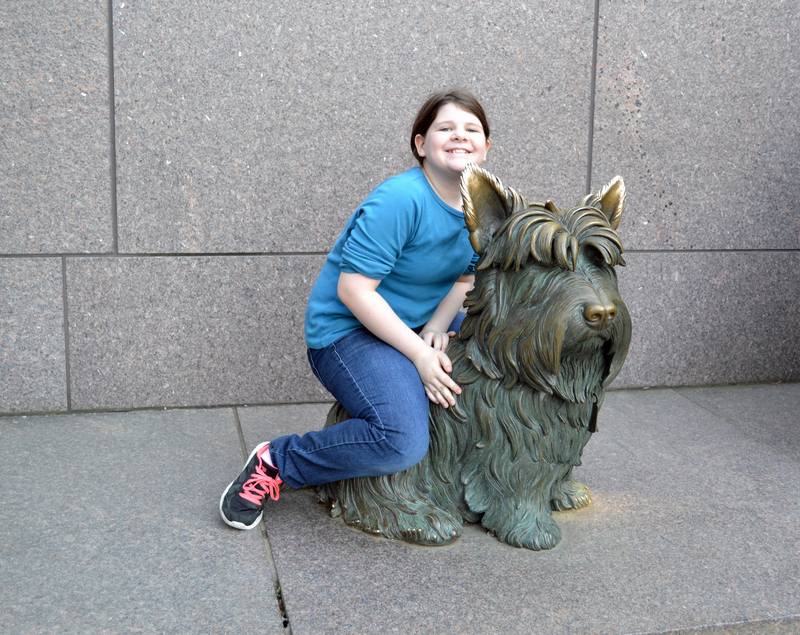 We found our way to the Franklin Delano Roosevelt Memorial after leaving the Vietnam Memorial. 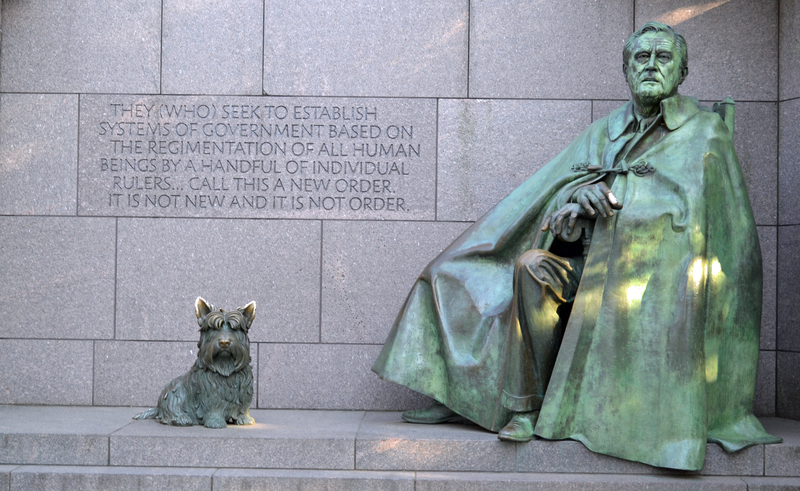 FDR was the longest-serving President in U.S. history. He was the first President to run for a third term in office…and then a fourth. 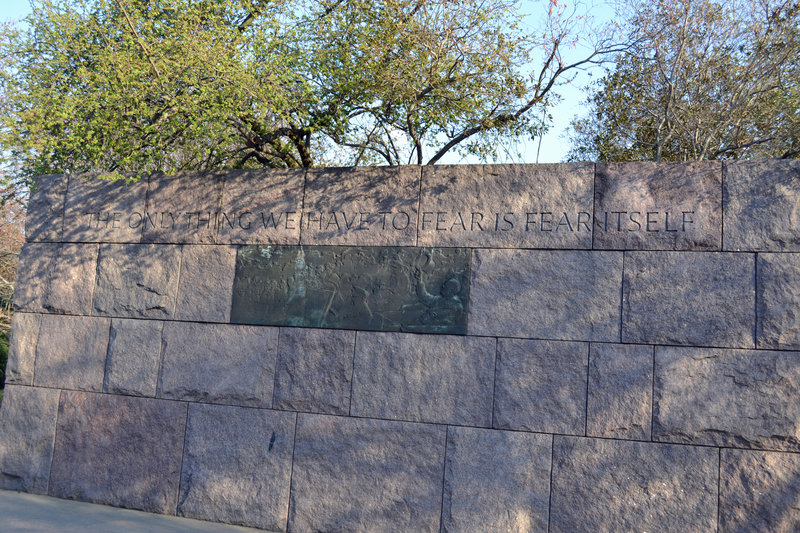 He died on April 12, 1945, a little over a month into his fourth term (inauguration day used to be March 4). Harry S. Truman completed Roosevelt’s term in office. During Truman’s administration, Congress passed the Twenty-Second Amendment to the Constitution, which limits the President to only two terms in office. 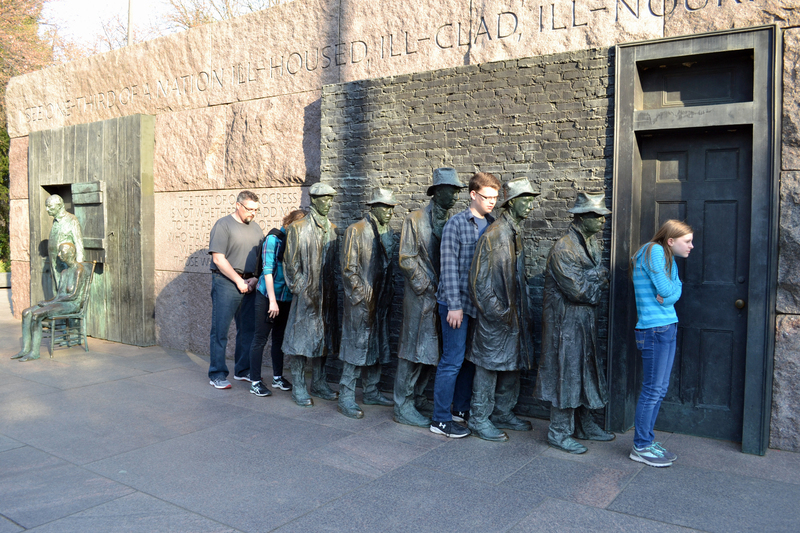 Roosevelt was known for seeing America through the Great Depression. He did this by starting many welfare programs which are still in effect today, such as Social Security. He also guided America through the majority of World War II. He isn’t one of my favorite Presidents, but I have an admiration and respect for his role in our country’s great history. 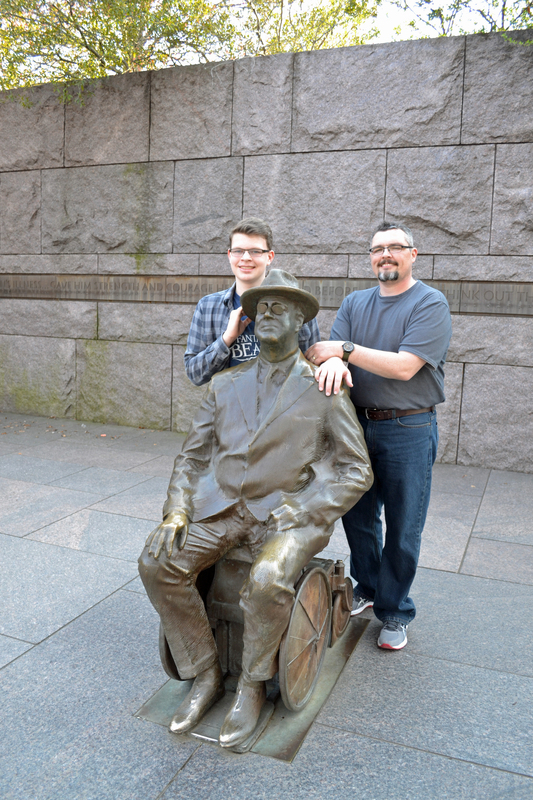 Roosevelt suffered from the effects of polio. 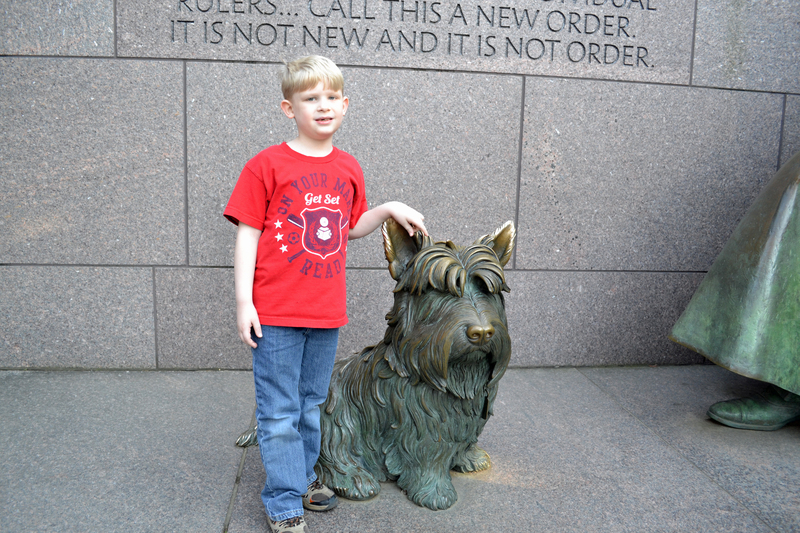 This was an impressive statue of Roosevelt – his cape conveniently hid his disability from the public – and their famous dog, Fala. 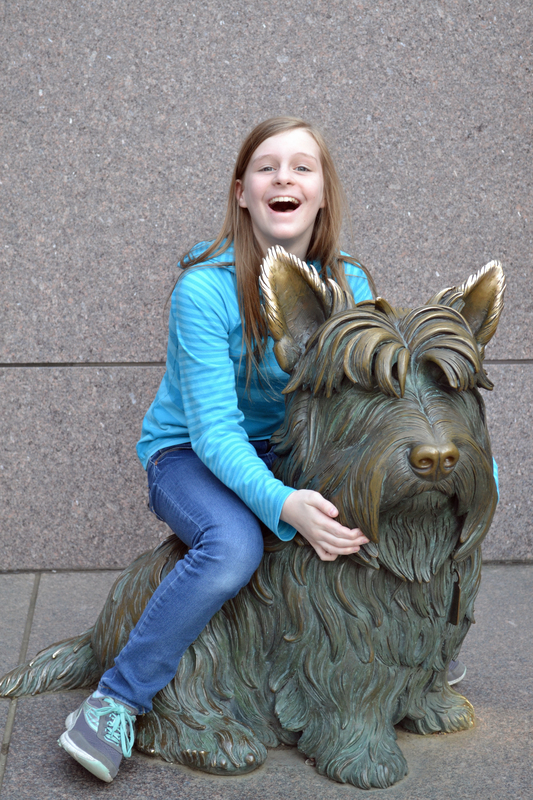 The kids couldn’t resist getting close to the dog! 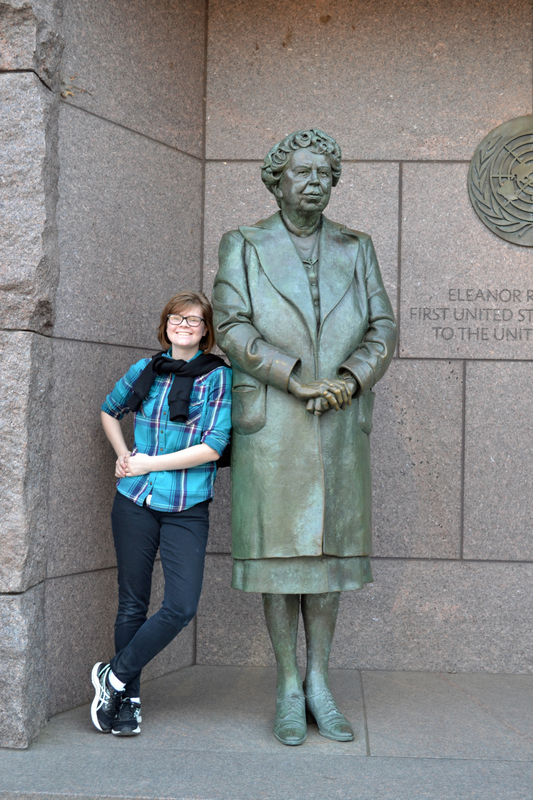 Eleanor was an active First Lady. Roosevelt would not have accomplished much of what he did without her being his eyes, ears, and, most importantly, his legs. She traveled where he could not, listening to the American people and bringing her reports to him. Thank you for traveling along with me! 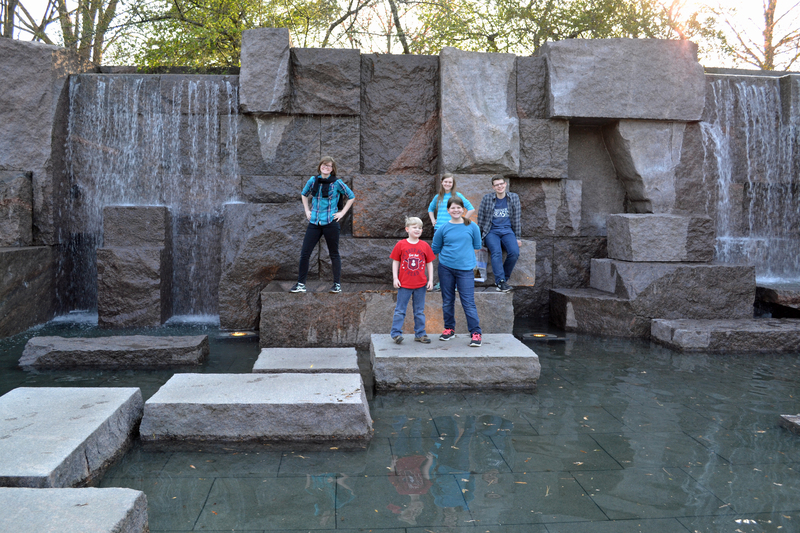 Only one more stop left in our D.C. adventure – the Jefferson Memorial.